I see a lot of anime enthusiasts every day dressing as their favorite characters. Beautiful cosplays have been done. They range from the masculine characters like Zoro or Law and Luffy, to the sexiest and most kawai woman characters like our beloved Nami <3. 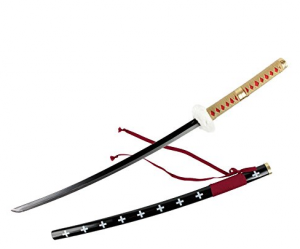 In this post i’ll suggest my favorite one piece cosplay swords, for the guys among you. 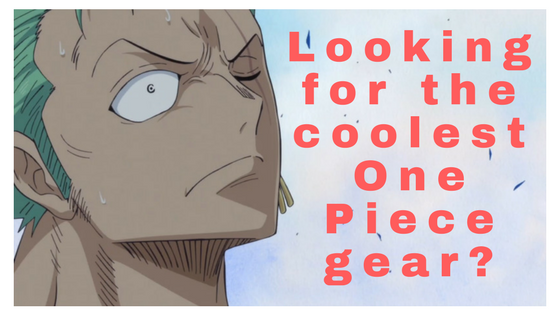 I hope that anyone who would like to cosplay their favorite one piece swordsman, will find this resource useful :). Lets start with one of our favorite Mugiwaras. We have outlined our theories regarding Zoro in the past, so it’s only natural to take the next step and try to help in a cosplay of him. 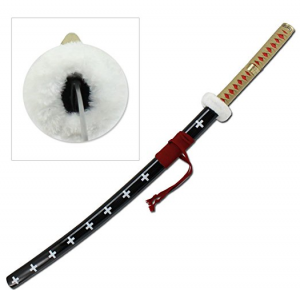 The main item that will skyrocket the quality of a Roronoa Zoro cosplay is his swords. Just roll into a party having replicas of his swords and guess what you’ll get? (Besides being called a lunatic of course :P). 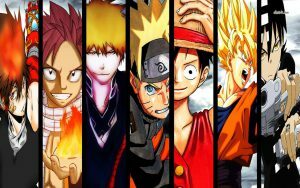 Everyone who loves One Piece will certainly be amazed. So, lets get it on with our top recommendations regarding Roronoa Zoro. Want to get the whole collection of Zoro’s swords? 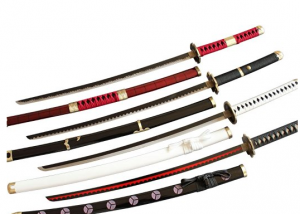 This four piece katana set is all you need. But, wait! 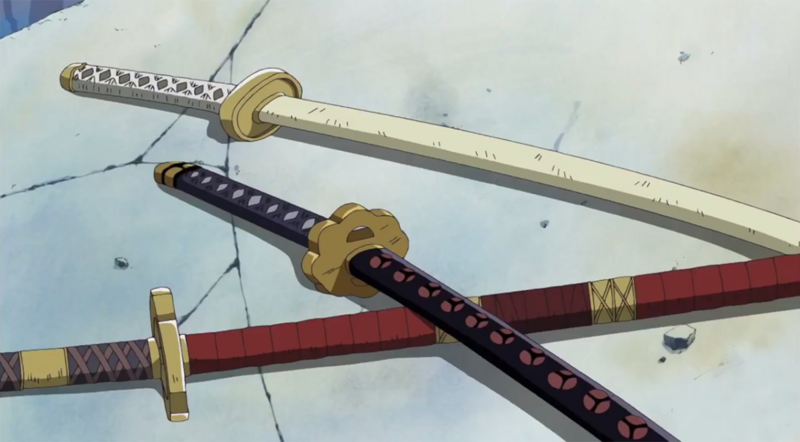 Zoro carries three swords, what about the fourth one? Well, try to remember better. He damaged his old sword, the one he got as a gift from the shop owner, in the fight he had with the Marine from the Ennies Lobby arc. Then, he acquired the cursed sword, Wado Ichimonji, in the Thriller Bark arc. So, that makes four swords ;). Here we have a choice that can become as custom as you want. You don’t have to buy all four swords of Zoro here. You can just pick one sword you like most and buy that one. But this is not the end of it. You can choose the way it looks and even choose the different materials to be used, such as the blades. This way you can customise the sword you buy fully. And the best part of it is that you even customise the price to your own liking ;). To top it off, dream2reality goes the extra mile and lets you order every sword you like. You just describe it and send them a picture or something like that and they will take it from there. Don’t fret, they are real pros. 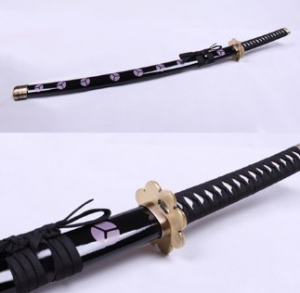 For those who don’t want to burden themselves with real swords, we have this wooden replica of Zoro’s sword here. 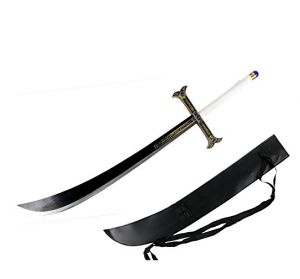 A high quality sword, with a really low price compared to the choices above, that is suggested for anyone with a tight budget. It’s all wooden, even the blade, but the best thing is the way it looks. It is colored in such a way, that all of it seems quite real. If you don’t pay attention to the detail, it can be a sword of similar apperance to the ones we suggested above. This post wouldn’t be complete, if we didn’t include the best swords of the Surgeon of Death. Trafalgar Law is another powerful swordsman in One Piece, so who wouldn’t want to cosplay him? I have even cosplayed him myself. I will post a picture of me in another post for those ready to laugh at me :P. Without further ado, lets move on to the best choices regarding him. Things are simpler now, just one sword not four :). With Trafalgar Law we wanted to start with a quite cheap option, to cover those who just want a fancy sword for their imaginative cosplay of the Surgeon of Death. This is a quite large sword at 40 inches, featuring a 440 stainless steel for the material of the blade. That only makes it one of the top value for money choices in today’s post. Lets state here that you should of course use these replica items with caution. That being said, the blade here is steel but not sharpened. I always want to provide alternatives, so here we have a similar sword that is even cheaper than the last one. 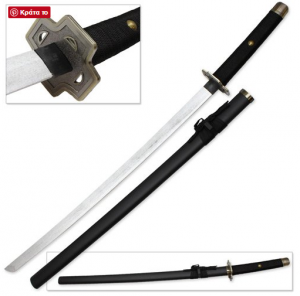 Its blade’s material is carbon steel and the dimensions are quite similar to the last one. So what differentiates this one is the fact that it is extra fluffy! We have all seen the different woolen parts in Law’s outfit. The guy is from North Blue and it was cold there pals :P. The woolen part of this sword is so fluffy, your nose will get all red with blood :D.
We will finish this one with the master of all swordsmen(at least for now :P). Hawkeye Mihawk was till the timeskip probably the most powerful swordsman in the world of One Piece. We don’t know what changed in the One Piece universe during the timeskip and just how strong other characters maybe, but certainly Mihawk is one of the strongest swordsmen in One Piece, that’s for sure. Lets get it off with our recommendations. A really big sword, fitting for the sword of Dracule Mihawk. After all, it is huge in the anime and manga as well. It is a sword close to 50 inches(!) with a carbon steel blade and a black anodize finish as well, that makes it look wicked really. To top it off, it comes with a leather sheath, so that you can protect the sword and basically yourself as well :P.
The downside of the above sword is its quite thin blade. From swordmaster comes a sword with a much more realistic blade, one that is extremely thick and close to the one Mikawk wields in the anime/manga. But it comes with a price, double from the last one. If you asked me, it’s so realistic you won’t regret it. Lets end our recommendations with a cheap/budget choice. 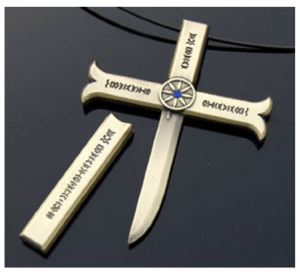 If you would like to have a necklace with a replica of Mihawk’s sword, go ahead, this one is a neat choice. To sum up, those where our best picks regarding one piece cosplay swords. Share your favorites in the comments, like our facebook page for updates and check our recommendations page for similar reviews to this one. I’m surprised at how reasonable the prices are on the Cosplay Swords. They look decent too. Awesome post. Keep up the good work! I noticed you didnt supply an example of a wooden sword for Trafalgar’s own sword. Im looking for one and I cant find any that I think are good enough. Most are either steel, too short, or way to expensive. Hey Devin. We are not making swords. 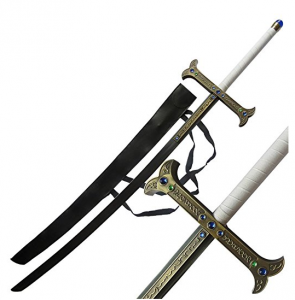 We are just recommending swords we have liked from Amazon. You can still buy them through the links provided, of course! In case you can’t find something be sure to ask! Previous Previous post: One Piece Sabo kills Burgess – What really happened?